KMart: $0.25 Crayola Crayons this week? 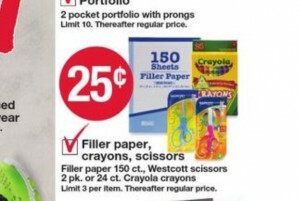 Check your local KMart ad to see if they have Crayola Crayons for $0.25 per box this week. This is a regional sale. The limit is 3 boxes per person. You can also pricematch at Target or Walmart, but only if your local KMart is running this sale. Looking for more? Read more posts about Back to School Deals 2015. Shopmium also has a $.25 rebate for crayola crayons, so you can get a free box!